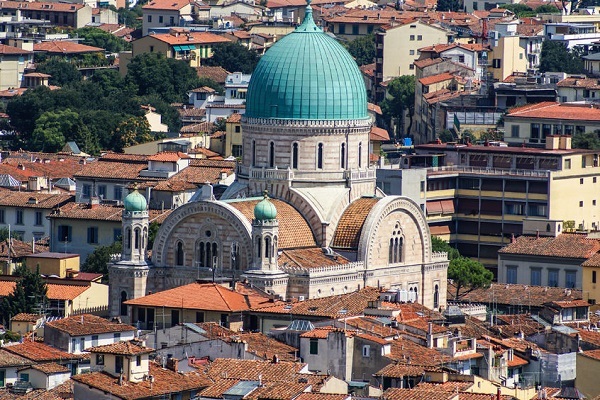 Venice, Florence, Rome and Naples are home to some of the world’s most beautiful and historic synagogues. Or, if you prefer, we arrange your wedding in a stately private castle or a magnificent villa. What could be better than standing beneath a beautiful chuppah looking out at the stunning landscape of the Italian countryside? If you would like to celebrate your Jewish wedding ceremony in Italy, then you will need to obtain permission from your rabbi at home. They will then send their authorization to the rabbi in Italy. If you are from a Reformed background, it is possible to celebrate your wedding in Italy with a Reform rabbi. This is becoming quite a popular option with couples, and enables you to have your ceremony in the private location of your choice without having to complete any paperwork from your home country beforehand. We can also provide you with a fantastic selection of high quality Kosher catering services. We offer several beautiful types of locations to choose from for a jewish wedding ceremony in Italy. We will assist you with the ceremony, reception, flowers and music for your jewish wedding in Italy. We can arrange Orthodox jewish weddings in Italian Synagogues or Reform Jewish Weddings with a Reform rabbi or you can bring your own rabbi. We also work with American Reform rabbits and British Reform rabbits, who can celebrate your jewish wedding in beautiful locations such as a private villa, castle or Italian garden. If you want to make the most of opportunities for good food and wine at your wedding, why not opt for a Jewish Wedding in Tuscany? Tuscany is home to some amazing medieval towns and cities that make very rich settings for a wedding. Here you will also find legendary towns like Pisa, with its famed Leaning Tower, or Florence, a real hub of arts and fashion. If the beach is more your thing, then why not start planning a Jewish Wedding in the Cinque Terre, or Italian Riviera? Here you will find splendidly rugged stretches of coast, beautiful golden sandy beaches with shimmering turquoise seas, and a whole host of fashionable resorts to party in afterwards. Whether you want a ceremony that is utterly contemporary or something more traditional, Italy is a fantastic place to celebrate that special day. From intriguing villas to open air coastal locations, this country is bursting with Jewish wedding opportunities.